Microsoft's Windows, which in 2015 fell to third place among the world's operating systems, will continue to lose share this year to both Android and Apple's combined OS X and iOS, Gartner said today. Not until 2017 will Windows begin to recoup some of the losses it's sustained since 2013, Gartner said in its latest device forecast. The continued decline of Windows makes Microsoft's job of pivoting to explorations of cross-platform opportunities all the more pressing. And it goes a long way to explain Redmond's drumbeat of new strategies, including this week's announcement that it will pursue a "conversations as a platform" initiative that aims to put automated assistants, or "bots," front and center on not just Windows, but also Android and iOS. According to Gartner, which provided Computerworld with its forecast broken out by operating systems, Windows will power about 283 million devices shipped in 2015, a 3.4% year-over-year decline. The 283 million represents 11.7% of the total of 2.4 billion devices shipped, over 80% of that number smartphones, and the majority of those smartphones running Google's Android. Six months ago, Gartner's forecast had pegged Windows in 2016 at 308 million devices, or 12.9% of the total. Gartner regularly downsized its estimates of both total devices shipped and Windows' portion of those shipments throughout 2015. The trend continued into 2016. In fact, last September, Gartner predicted that Windows would not slip behind Apple's combined OS X and iOS until 2017. But according to the research firm's latest data, Windows dropped to No. 3 in 2015, thanks to Apple shipping 297 million OS X/iOS devices -- 4 million more than Windows -- and grabbing the second spot behind way-way-out-there Android and its leading 1.3 billion devices. In Gartner's current forecast, Windows will dip 3.4% in 2016 to 283 million devices shipped while Apple's OS X/iOS will climb 2.1% to 303 million. By the end of the forecast window -- the calendar year 2018 -- Windows will be even farther behind, shipping 298 million devices compared to Apple's 334 million. If Gartner's prognostications are on target, Apple will ship more OS X/iOS devices in 2018 than OEMs (original equipment manufacturers) did of Windows systems in 2013. Overall, Gartner's latest forecast continued the trend of pessimism not only for Windows, but for all device shipments. The researcher now believes 2.41 billion computing devices will ship in 2016 -- 80.4% of them smartphones -- compared to a same-year prediction of 2.46 billion made in the fall of 2015. Not surprisingly, the majority of the forecast reduction was pegged to smartphones, whose growth will slip into single digits for the first time. "The double-digit growth era for the global smartphone market has come to an end," said Ranjit Atwal, a Gartner analyst, in a statement. "Historically, worsening economic conditions had negligible impact on smartphone sales and spend, but this is no longer the case. China and North America smartphone sales are on pace to be flat in 2016, exhibiting a 0.7% and 0.4% growth respectively." Traditional PCs, more mobile designs, and tablets will also take beatings of various kinds this year, Gartner asserted. The most bruised? Traditional personal computers. Shipments of those machines will slump to just 228 million, a 6.6% decline. Although what Gartner called "ultra-mobiles" -- such as Apple's MacBook and MacBook Air notebooks, and Microsoft's Surface Pro 2-in-1 -- will climb 26.7% to 57 million this year, even that hot design category won't make up the difference. Together, the two categories are expected to result in 285 million shipments, 1.4% fewer than in 2015. Gartner, like Microsoft and Windows OEMs, bet on Windows 10 to drag the ever-broader "PC" category out of the doldrums next year. Analysts assumed that in 2017, shipments will increase by 3.9% to 296 million. "In 2016, the PC market will reach its last year of decline before returning to growth in 2017," Atwal said. "The biggest challenge, and potential benefit for the PC market, is the integration of Windows 10 with Intel's Skylake architecture. It has the potential for new form factors with more attractive features." If that sounds vaguely familiar, it should. Nine months ago, Gartner forecast that 2016's PC + ultra-mobile shipments would rise 3.7%. Then, Atwal hedged his bet on Windows 10, saying, "Windows 10 could boost replacements during 2016 [emphasis added]," but anticipated that growth would return to the PC business in the year. 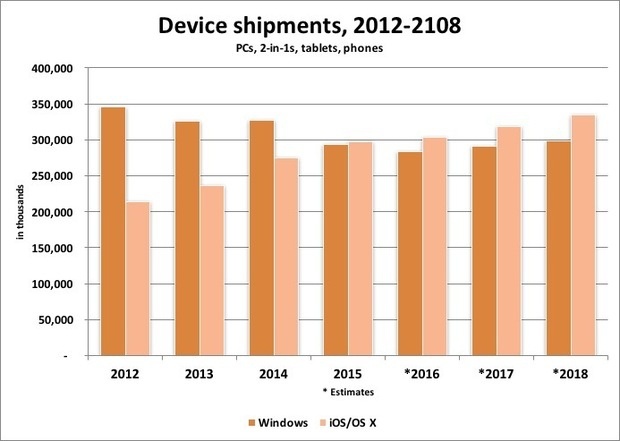 Shipments of Windows-powered devices -- personal computers, 2-in-1s, tablets and smartphones -- dipped beneath those of Apple's iOS and OS X devices in 2015. Microsoft won't recover the No. 2 spot during the forecast period, which runs through 2018.